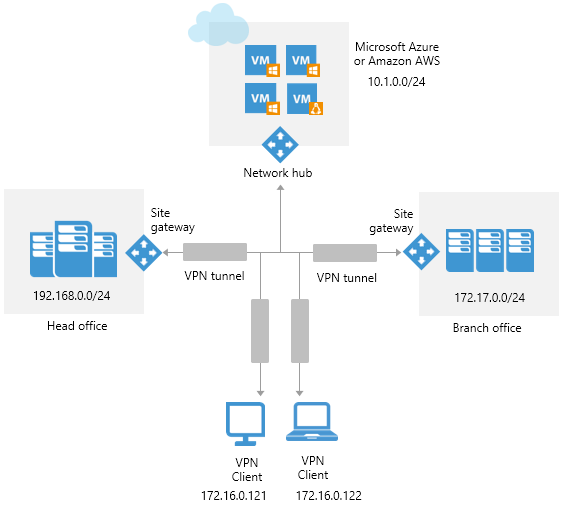 Set up a site-to-site VPN between company offices and a Microsoft Azure network to which VMs restored in Microsoft Azure are connected. Set up a point-to-site VPN between remote computers and a Microsoft Azure network to which VMs restored in Microsoft Azure are connected. Allow remote users to get access to a company network through a Microsoft Azure network. Veeam PN lets you set up VPN connections between Microsoft Azure networks and on-premises networks. The solution is based on the OpenVPN technology and features a web-based interface that simplifies VPN configuration and administration.